Good morning everyone! When there’s significant news to report, there’s nothing I can do but get straight to it. This was sent to me from Rob Woodruff, who I haven’t heard from in a good while — he’s very busy. There’ll be more independent reporting this week – a story on fly fishing Lake Buchanan for carp comes out tomorrow. 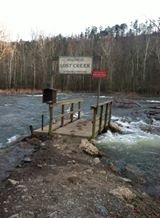 At about 11:30 AM on Monday, March 16, The US Army Corps of Engineers began releasing 1100 CFS of water down Spillway Creek at Beavers Bend State Park. They did this without warning people on the creek and river, the officials at Beavers Bend State Park, The Oklahoma Department of Wildlife Conservation or even the USACE Area Manager who works for them. 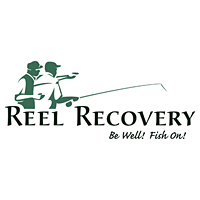 The initial release sent a 4 foot wave of water and debris down the creek, knocking down, bruising, battering and washing away anglers and people walking along creek banks. The Park Rangers and the Swift Water Rescue Unit from Broken Bow Fire Department had to respond and rescue people stranded by the high water. My wife, Jenny Mayrell-Woodruff, was guiding a trip at the time and had to act quickly to get herself, her clients and a 10 year old boy who had been separated from his parents to safety. It is very fortunate that no one drowned or was seriously injured. That it was Spring Break and one of the few weekdays of the year when there are families and small children on the river, the release was scheduled well in advance to allow routine maintenance on the generators at the hydroelectric plant and the lake was only two feet above normal height and 25 feet under flood pool, all add to the evidence of a very poor decision made by the Tulsa Office of the US Army Corps of Engineers. Currently about 1000 cfs (typical flow is around 100 cfs) is being released through two flood gates at Broken Bow Dam. This flow is expected to continue for the next 30-45 days. The water is very clear and 48 degrees The river is fishing well in places, but it takes planning and cautious wading to fish it safely. I would only recommend fishing by physically fit, strong, experienced waders over 14 years of age right now. Myself and most of the guides on the river are following the same criteria for guided trips at this time. Be aware that a warning horn means an increased flow from the Spillway, not the usual Power House release. Spillway Creek, The Bluffs, The Evening Hole and Lost Creek will all be effected by the higher water. 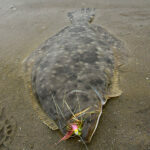 Even with the higher water conditions, fishing is very good in some areas. 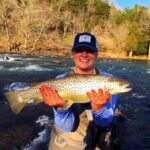 My wife,www.flyfishbeaversbend.com, caught this beautiful 24″ Brown Trout on March 25.